O2Micro (NASDAQ:OIIM) reported Q4 2018 revenues of $16.6 million, down slightly sequentially, but still up 9.0% year over year and within the range of guidance. Guidance for revenue for the fourth quarter of 2018 was sequentially flat plus or minus 5% from Q3 2018. For Q1 2019, the company is guiding to midpoint revenues of $14.7 million, which would be up 4% over last year. The range is down 12%, plus or minus 4% sequentially. Despite the industry suffering an inventory correction as supplies catch up to demand after shortages last year, O2Micro still expects to grow throughout 2019 with acceleration in the latter half as design wins convert to ramping production. Gross margin was 50.3%, down sequentially from 50.5%, and year over year from 50.5%, due to product mix. R&D declined to $5.0 million in the quarter, from $5.2 million in Q3 when spending ramped due to a push to complete new battery management products. In last year’s quarter O2Micro spent $4.8 million. SG&A was high at $5.4 million versus $4.7 million last year and $4.9 million in Q3. In Q4 2018, the company had an extra one time expense of $200,000-$250,000 for logistics for the accelerated deliveries of orders. Total operating expenses in the quarter were $10.4 million, a million more than last year, and compared with $10.2 million in Q3 2018. Operating losses in Q4 were $2.1 million versus $1.8 million last year and $1.7 million in Q3. Most of the increase is explained by the one-time logistics expense. In the quarter, the company had an unrealized loss of $1.4 million on a long-term investment from its stock ownership of Excelliance MOS Corp. (5299.TWO) marked to market. During the quarter it sold $1.3 million of this stock (360,000 shares) and now owns 2.8 million shares. In Q1 it plans to sell another 300,000 to 500,000 shares, which at today’s price would be $1.1 million to $1.9 million. There was also $530,000 of other income comprised of its normal rent of $101,000, cash dividend income from long-term investment $290,000, and some government subsidizes of $138,000. Taxes were $330,000 of which $105,000 was paid for gains on the sale of stock. The company reported GAAP net loss of $3.1 million versus a loss of $1.9 million last year. This yielded a GAAP loss per share of $0.12 versus a loss of $0.07 a year ago. Non-GAAP net loss was a loss of $1.4 million, versus a loss of $1.0 million last year. The company reported a non-GAAP EPS loss of $0.05, versus a loss of $0.06 last year. On December 31, 2018, the company had $38.6 million in cash and equivalents (or $1.49 per ADS), down $2.2 million sequentially. During the quarter EBITDA was a negative $1.3 million. The company burned $3.3 million in the quarter and spent $406,000 on capital expenditures. The company believes it can be EBITDA positive between $17 million to $19 million in quarterly revenues, and profitable between $19 million to $20 million in revenues. Intelligent lighting is seeing growth, which is expected to accelerate in the second half of the year as the industry shifts to 4K TVs and 8K volumes increase. 8K is being gated by the lack of content available. Higher-end TVs and HDR monitors are adding more highly integrated application-specific devices, including O2Micro’s local dimming products. According to Futuresource Consulting, 2018 will be the year 4K UHD moves mainstream and will account for nearly 50% of all TVs shipped worldwide by year-end. 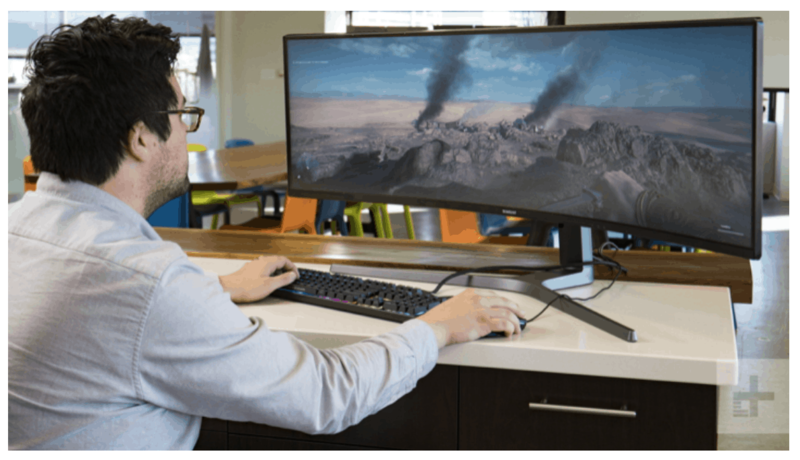 HDR monitors are gaining traction with prices ranging from $200 to $2000 and targeted toward gaming. Battery management is the company’s second largest sector and is growing double digits as the industry continues to move to lithium ion batteries as they become ever cheaper and more powerful. Customers selling products such as e-bikes, e-vehicles, and vacuums and UPS power supplies are making the business less cyclical than when most of the product went to power tools. The company is providing the industry with more cost effective products, as well as more complex patent protected products for high-end solutions. Customers have evaluated and are now beginning to design in O2Micro’s new ARM based chips with allows connectivity for IoT. In particular it is being used for construction equipment for owners to locate missing tools and machines and is also being incorporated into UPS power supplies and solar installations to allow users to remotely access the devices for status information. There are many other applications; for example, the company indicated on new customer was planning to put connectivity into its robotic vacuum cleaner. Power Products continue to expand its product line, increase its design wins, and serve a broader array of customers. The company expects accelerating sales as new power products continue to gain wider acceptance in the smartphone and tablet market including higher end customers. O2Micro’s new power products have ramped into production through Q3 and Q4, however legacy products suffered a shortfall as there still are shortages of processors for notebooks. The company had further design wins for our smart phone and tablet products include new charger ICs, on-the-go charger booster, and accurate gas gauge. Profitable fabless semiconductor companies trade at much higher valuations. Were we to use the average enterprise value to trailing twelve-month sales of 5.5 times and apply it to OIIM’s trailing 12-month $62.7 million revenues, we would calculate an enterprise value of $345 million. Adding to it $38.6 million in cash gives us a market cap of $383 million or $14.74 per share. We believe that once the company shows sustainable revenue growth and cash breakeven, the market should afford it a valuation closer to this price.